Parents: Talisman x Kishmish Luchysty Flowers: female Ripens: 1.-15. September Shoot vigour: stro.. Early season, blue seedless table grape vine, resistant against fungal diseases. Parents: Kodrianka.. Early season, white seedless table grape vine, resistant against fungal diseases. Parents: Lora x R.. 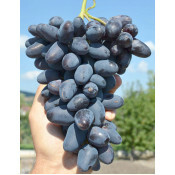 Early season, blue seedless table grape vine, resistant against fungal diseases. Parents: (V. labru.. Very early ripening seedless rose variety. 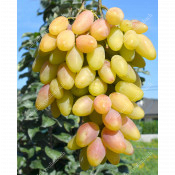 Grapes have a muscat flavor. Clusters can stay hanging on..